A small island generator written in rust. 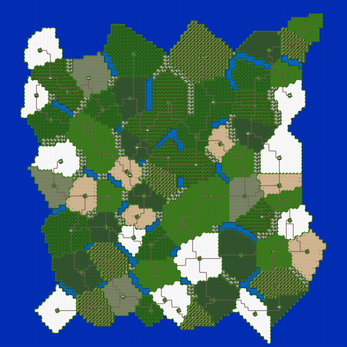 4) For each Voronoi cell, choose a biome. If the cell touch the border of the grid, the biome is forced to sea. 5) Generate a covering graph for the cells whose biome is not sea. 6) Place mountains or lakes on the border of neighbouring cells that are not connected in the graph. 7) Trace roads between neighbouring cells that are connected in the graph. If the road cross an obstacle (sea, lake, river), do not trace the road. 8) Place a city on the center of the Voronoi cell whose biome is not sea. The program will output the image island.png. Sorry for the very late reply (I don't check itch.io often, and I didn't check the mail adress I'm using for itch.io for a while). I'm already on the procjam discord for several months, so I know about @redblobgames. Why Rust ? I wanted to try Rust for a while, so I took the opportunity of the jam to do it. I already coded map generators with some similitudes to this one, so this was more about testing Rust. However, I also wanted to check the complexity of writing that generator, to check if it could be done in coding dojos. I have mixed feelings about it. I found it user-unfriendly because of the ownership concepts breaking many way of thinking when you come from object-oriented grounds. I'm unsure if I'll use it again for other procedural projects.